You Are Here: Home » QuickRead Featured » What Drives Business Value? Have you ever asked your clients what drives the value of their businesses? If they feel comfortable that they know what drives their business’ value, have you ever asked them why it does? In this article, first of a two part series, Sarah von Helfenstein shares her thoughts on the kinds of things that we, as business analysts and appraisers, should consider when assessing business value. Have you ever asked your clients what drives the value of their businesses? If they feel comfortable that they know what drives their business’ value, have you ever asked them why it does? Perhaps your clients are too busy in the trenches of the day-to-day fight to survive and thrive to give this much thought. Or perhaps they believe strongly that their gut feel for the pulse of their markets and customers makes theoretical considerations like this a waste of time. Yet, the uncertainty, risk, and change they face in most or all aspects of their business activities are keeping them up at night. The purpose of this article is to remind the reader of the kinds of things we, as business analysts and appraisers, should consider when assessing business value. Our hope is that you, the reader, will find them useful reminders and tools for helping your clients gauge and enhance the value of their businesses. After all, we have access to client information that should allow us to be far more than number-crunchers seeking a point estimate of value. While the principles discussed are the output of many brilliant minds from a wide range of business disciplines, they have been compiled and structured in a highly usable form by one of our colleagues, Warren Miller, in his classic text, Value Maps: Valuation Tools that Unlock Business Wealth. 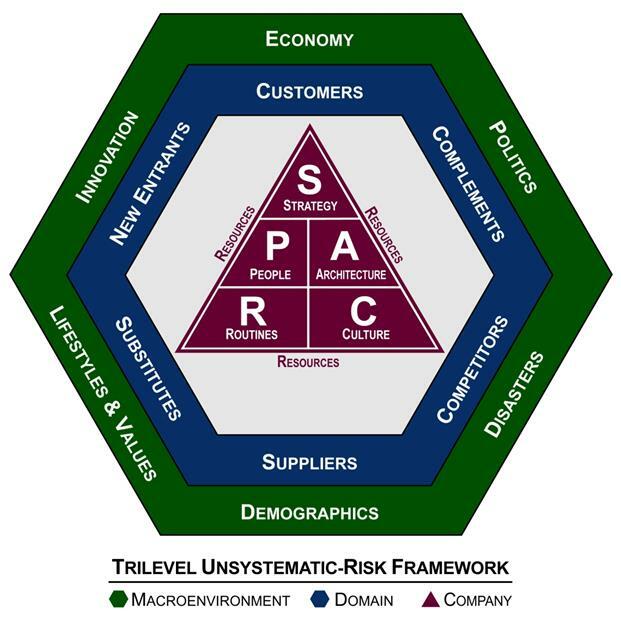 He calls his structural tool the “Tri-Level Unsystematic Risk Framework.” The framework consists of two nested hexagons: one for the macroenvironment, and one for the domain (industry). Inside of these is a triangle divided into five segments Mr. Miller calls SPARC—Strategy, People, Architecture, Routines, and Culture. We will use this framework as the foundation for our discussion. Value drivers are those capabilities, activities, or routines which: (1) reduce risk, (2) increase free cash flow [i.e., profitability], or (3) raise expected growth in free cash flow, or any combination of the three preceding characteristics. Value drivers differ from critical success factors (CSFs). CSFs arise in the context of being successful in an industry. Certain of them must be present in a given domain in order for a company to be successful in that arena…Not so with value drivers. Unlike CSFs, value drivers are unique. If they’re not, then they won’t be value drivers for long. Why are Value Drivers Important? Success in capitalism is…a perpetually moving target…Capitalism has brought more freedom and a higher standard of living to a greater number of people than any other system known to humankind. Yet it is an unforgiving taskmaster. It demands change at the worst conceivable time: when the heavens have opened up and are raining money on managers, shareholders, and employees who have struggled for years to make the company successful…“overnight.” That is when change is most important and most difficult. But competitors…keep going 24/7. Teams and companies that pause to bask in the warm sunlight of success find themselves suddenly in the dark being trampled by hungrier, leaner, faster-moving rivals. Value drivers are those attributes of a company that create and sustain its value. If they are not identified, nourished, and changed or discarded as necessary, business success is short-lived at worst or maintained on life support at best. Ignorance of value drivers makes businesses and their owners, no matter the size or current health, vulnerable to unforeseen risks and susceptible to an inability to capture unforeseen opportunities and rewards. We can use Miller’s tri-level unsystematic risk framework to conduct “outside-in” analysis in search of value drivers and sources of risk. The two outermost hexagons, “Macroenvironment” and “Domain,” represent the “Opportunities and Threats” component of a common SWOT analysis. Miller suggests (and we agree) that the company cannot be well analyzed or understood until and unless solid macroenvironmental and domain analyses have been conducted. Economy—growth; interest rates; inflation; unemployment. Innovation—hardest of all macroenvironmental influences to research, and seldom announced to markets in advance. Lifestyles and values—these change slowly, but they do change. Disasters—wars, homeland attacks, epidemics, natural disasters. Politics—legislators, judges, regulators, NGOs and special-interest groups. Of these categories, only Economy and Demographics have hard data available for analysis. The remaining categories must be studied through trade publications, conferences or other trade education, regular networking, and staying informed using reliable business sources. New entrants—If the barriers to entry to the domain are low, the likelihood of new players in the field is high. Threats to incumbents include increasingly risky growth and profitability. Competitors—Competitive intensity generates a wide range of risks such as margin pressure, slowed growth in demand, undifferentiated output, or the need to develop diverse competitive strategies. Customers and suppliers—Both of these forces increase risk to players within a domain due to their bargaining power, ramped up by technological connectedness. Product substitutes and complements—These forces can substantially increase risk to market share, growth, and profitability. How Could an Understanding of Macroenvironment and Domain Offer Additional Value to a Client? While regular study of the macroenvironment does not provide direct insight into value drivers within a client company, it will identify and keep you keenly aware of sources of risk and alert you to the need for a particular client to both address such risk and seize new opportunities created by it. In addition, many smaller incumbents within domains never look at and may not understand how these forces affect the values of their businesses. Investors often buy businesses without consider domain effects. Yet, if your client, whether business owner or investor, misses signals regarding the level of competitive intensity in the company’s domain, the degree and/or source of bargaining power the company’s customers have, or the entrance of several compelling substitutes for the product of interest, the client may find her business has little value when she goes to seek funding to take it to the next level or plan an exit. You, as the business appraiser, can help. Study of the macroenvironment and domain can provide you with more to offer your clients than a mostly-templated analysis and report. If you are a CPA, your higher level of knowledgeableness about client macroenvironments and domains may further solidify important client relationships. If you are a corporate financial manager, it will enrich the quality of the insights you bring to the company’s decision processes. What will it Take to Develop an Understanding of the Macroenvironment and Domain? Will you need to conduct in-depth research into every aspect of each client’s macroenvironment and domain? The short answer is probably not. The longer answer is that, while it is not necessary to spend hours each day doing reading and research on macroenvironmental and domain issues, it is critical for you to select two to three reliable sources of information, including industry-specific trade publications and business news, and keep up with them on a regular basis—at least biweekly, if possible. Note down, print, and copy the URLs of items that catch your eye and insights they provide. Depending on the size of your practice, assign junior staff to perform the research and have them keep you updated once a month. Definitely buy Value Maps and work your way through it. Teach your clients how to do this for themselves. Then, as you meet with management and perform your valuation engagements, you will be able to discuss knowledgeably how macroenvironmental and domain issues are affecting client business. No more lengthy canned “Economy and Industry” sections in your reports. Instead, you will offer abbreviated and directly applicable analyses your clients can actually use. Your value goes up and so does theirs. Part Two will explore the use of SPARC to increase your (and your clients’) deep understanding of value creation. Miller, Warren. 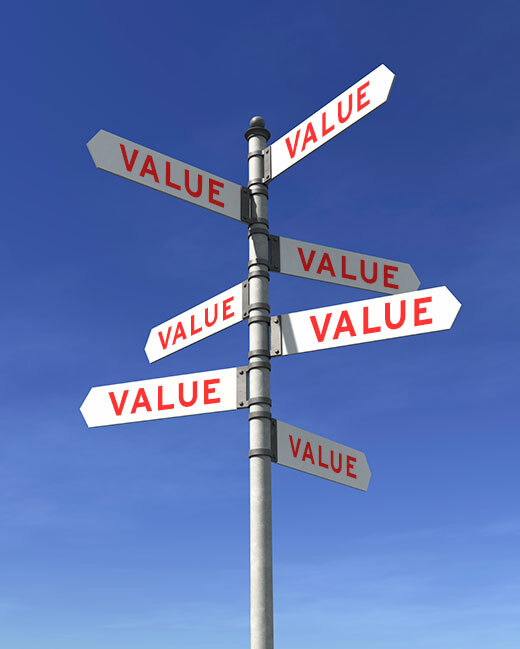 (2009) Value Maps: Valuation Tools that Unlock Business Wealth. New Jersey: John Wiley & Sons, Inc. p. 131. Sarah von Helfenstein is CEO and Founder of Value Analytics & Design, LLC, a Boston-based valuation and management consulting firm. Ms. von Helfenstein is a 30+-year veteran of the start-up wars. Ms. Helfenstein has created, launched, managed, and consulted to new initiatives inside/for established enterprises and on a stand-alone basis. Ms. von Helfenstein can be reached at: (617) 401-1122 or e-mail to: svonhelf@valueanalyticsanddesign.com.